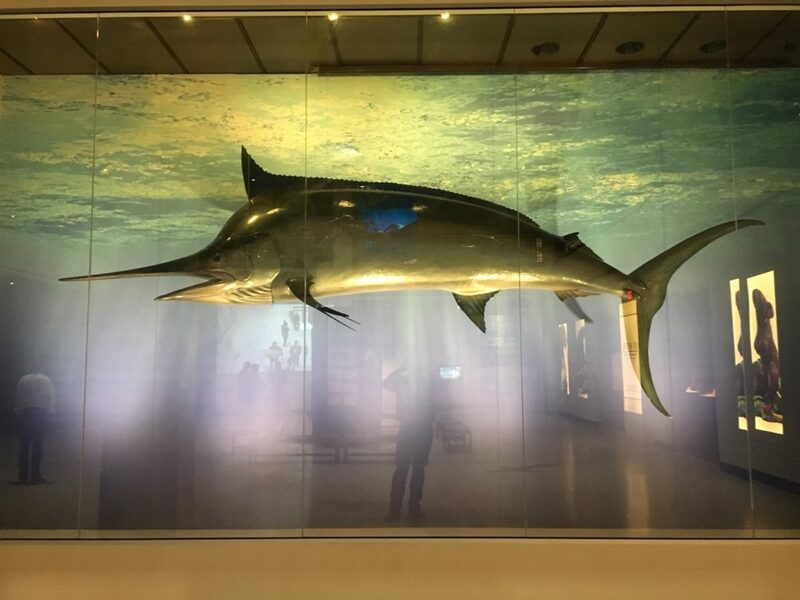 Walking into the Alfred C. Glassell, Jr. Hall, the central hall in our general exhibitions, the first thing most visitors lay their eyes on is the giant black marlin mounted behind glass in the back of the gallery. The massive fish is a magnet for visitors, with more than one prospective bass-pro posing for pictures in front of it. But it’s the story of the man who reeled this beast in that we’re going to focus on in today’s edition of Beyond Bones. His name was Alfred C. Glassell, Jr. and apart from being a millionaire oil tycoon and a major patron of our museum, he also had a secret life as an adventurer. The fish was reeled in by Glassell off the coast of Cabo Blanco, Peru in 1953. 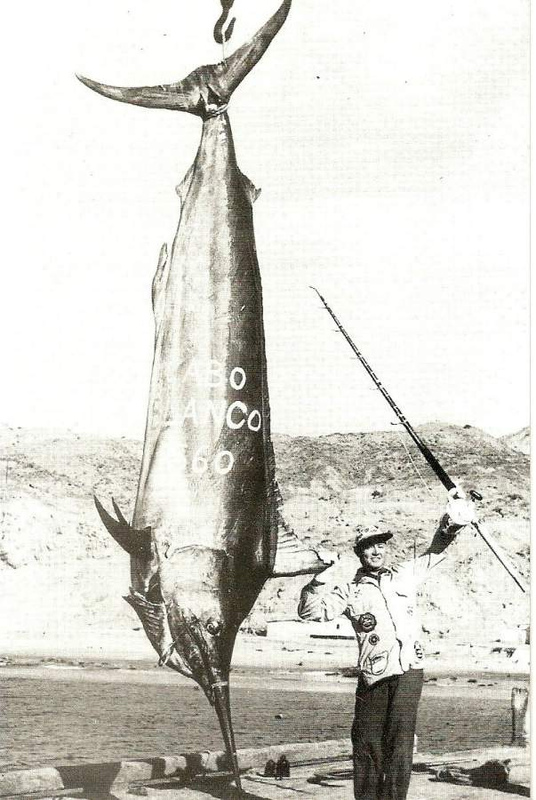 At 1,560 pounds it set the world record for largest black marlin ever caught with a rod and reel, a record that still stands despite modern improvements to boats and fishing gear. To understand how crazy an accomplishment this was, take a look at the picture below. That tiny rod that Glassell is thrusting victoriously toward the heavens, a mere splinter compared to the gigantic marlin, is the one he used to bring up his record breaking fish. And this was way before carbon fiber and other modern materials were used to make fishing rods. Unlike most mounted fish, the specimen we have on display is made from the fish’s original skin, carefully preserved by means of an expensive and time consuming process. Glassell achieved worldwide fame thanks to his record breaking catch. 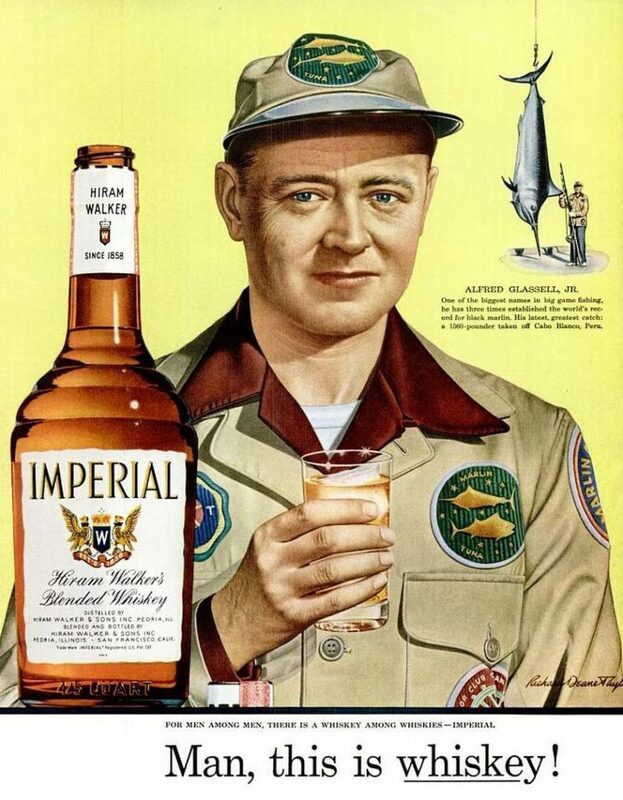 He was even asked to be featured in a Hiram Walker Whiskey advertising campaign. Posters created for the campaign featured famous he-men types holding up a glass of the good stuff. 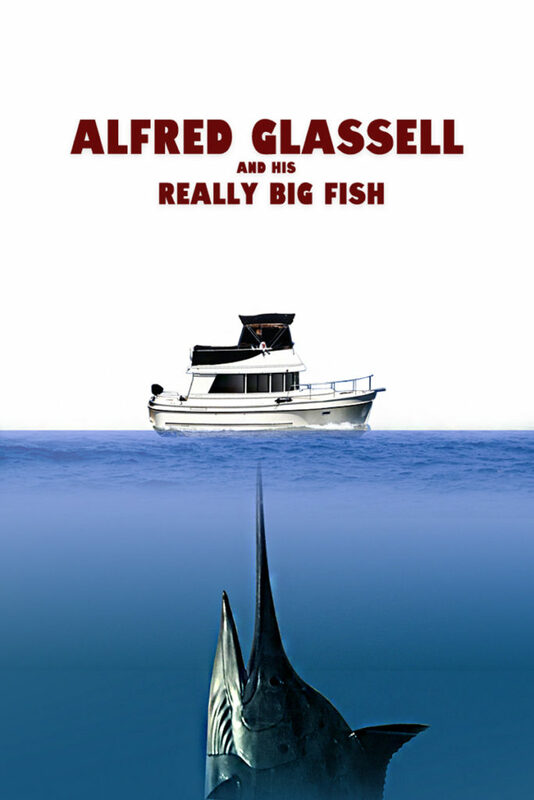 You can see an image of the poster featuring Glassell below. Other posters created for the campaign featured jaguar hunters and deep sea explorers. Glassell’s celebrity status helped turn Cabo Blanco into a major destination. The tiny town is extremely isolated even today. On Glassell’s first trip to the spot in the early 50’s he had to fly into an airstrip in Talara, a city in Northwestern Peru, then drive 50 miles through the the desert on treacherous jeep tracks to a coastal city called Manorca. From there he caught a ride on a tuna ship to Cabo Blanco. Say all you want about fishing being boring, Glassell was a regular adventurer! After seeing for himself the fantastic variety of game fish to be had in the area, he and some acquaintances founded the Cabo Blanco Fishing Club. It cost $10,000 to become a member, but despite the huge membership price and the location’s isolation billionaires and A-list celebrities like Humphrey Bogart and Paul Newman flocked to the spot. Even Ernest Hemingway visited during the filming of the movie version of his book The Old Man and the Sea. In fact, footage from one of Glassell’s catches was used in the film. The club became such a popular destination that within 2 years the club founders were turning down offers if $50,000 to join. When he wasn’t hanging out with Hemingway or shooting the breeze with Bogart (or for that matter handling his side job of running a billion dollar corporation) he was captaining voyages of discovery on his private yacht, the Argosy. He organized an expedition for Yale in 1957 and another for the University of Miami in 1961. Glassell’s 1560 pound black marlin on display at the Houston Museum of Natural Science. We never run out of stories to tell here at the Houston Museum of Natural Science. And often times the stories are surprising and unexpected. Who could have guessed that one of the fish in our collection shares a mutual acquaintance with Bogart? This is just one of the unusual connections our collection has to the wider world. Come see our objects yourself and discover some of the stories they have to tell. All it takes is a ticket to our Permanent Exhibit Halls! Previous Post Want To Start A Museum career? Here's How To Do it. Next Post Are Zombies Real? Our Education Team Investigates! Inspired by the grasshopper, researchers have built a new robot that can jump 27 times its own height. That’s a world record. You can learn more about the project here. Footage provided by 2008 SAVE/EPFL, images by © 2008 Alain Herzog/EPFL. Produced by Flora Lichtman .